Set (iV^sf aiJo fEast side. The Panama Canal does not, as is quite generally thought, cross the Isthmus from east to west. As is shown on the accompanying map, its general direction is from northwest to southeast, the Pacific entrance near Panama being about 22^ miles east of the Atlantic entrance near Colon. It is a lake canal as well as a lock canal, its dominating feature being Gatun Lake, a great body of water covering about 164 square miles and occupying the northern half of that portion of the Isthmus through which the Canal passes. This lake is an elevated body of water with a surface level maintained at from 85 to 87 feet above sea level by the Gatun Dam and locks on the Atlantic side and the Pedro Miguel Locks and Dam on the Pacific side. (Plate B.) The Culebra Cut is really an arm of the lake. On both Atlantic and Pacific sides there is an approach channel, which is an inlet of the sea, extending from deep water in the sea up to the foot of the locks which lift vessels to the level of the lake through which they are to pass. PLATE B-DIAGRAM SHOWING LAKE ELEVATION'. tide, and on the Pacific side, where the maximum oscillation is 21 feet, the depth will be 45 feet at mean tide. The mean sealevel in both oceans is the same. Throughout the first 15 miles from Gatun, the width of the Lake channel will be 1,000 feet; then for 4 miles it will be 800 feetr and for 4 miles more, to the northern entrance of Culebra Cut at Bas Obispo, it will be 500 feet. The depth will vary from 85 to 45 feet. The water level in the Cut will be that of the Lake, the depth 45 feet. Three hundred feet is the minimum bottom width of the Canal. This width begins about half- a mile above Pedro Miguel locks and extends about 8 miles through Culebra Cut, with the exception that at all angles the channel is widened sufficiently to allow a thousand-foot vessel to make the turn. The Cut has eight angles, or about one to every mile. The 300-foot widths are only on tangents between the turning basins at the angles. The smallest of these angles is 7ï¿½ 36', and the largest 30ï¿½. In the whole Canal there are 22 angles, the .total curvature being 600ï¿½ 51'. Of this curvature, 281 10' are measured to the right, going south, and 319 41' to the left. The sharpest curve occurs at Tabernilla, and is 67ï¿½ 10'. Aï¿½Passageway for operators. Bï¿½Gallery for electric -wires. Cï¿½Drainage gallery. Dï¿½Calvert in center walls. Eï¿½These culverts tun under the lock floor Gï¿½Culverts in sidewalls. and alternate with those from side walls. IIï¿½Lateral culverts. Welts opening jiom lataal culverts into lock chamber. D- Generator instrument transformers Eï¿½ Generator switches F - Bus 1 1 G- 8us2. P - 30 ton crane. handling plant, batteries, and for the lighting of the locks and Zone towns and, if desirable, the Panama railroad. The building will be constructed of concrete and steel, and will be of a design suitable for a permanent power house in a tropical country. The dimensions will be such as to permit the installation of three 2,000-kilowatt units, and provision will be made for a future extension of three additional similar units. It will be rectangular in shape, and will contain one main operating floor, with a turbine pit and two galleries for electrical equipment. The building, with the machinery and electrical equipment, will be laid out upon the unit principle, each unit consisting of an individual head gate, penstock, governor, exciter, oil-switch, and control panel. sequently a surplus will need to be stored for only three or four months of the dry season. The smallest run-off of water in the basin during the past 22 years, as measured at Gatun, was that of the fiscal year, 1912, which was about 132 billion cubic feet. Previous to that year the smallest run-off of record was 146 billion cubic feet. In 1910 the run-off was 360 billion cubic feet, or a sufficient quantity to fill the lake one and a half times. The low record of 1912 is of interest as showing the effect which a similar dry season, occuring after the opening of the Canal, would have upon its capacity for navigation. Assuming that the Gatun Lake was at elevation plus 87 at the beginning of the dry season on December 1st, and that the hydroelectric plant at the Gatun Spillway was in continuous operation, and that 48 lockages a day were being made, the elevation of the lake would be reduced to its lowest point, plus 79.5, on May 7th, at the close of the dry season, after which it would continuously rise. With the water at plus 79 in Gatun Lake there would be 39 feet of water in Culebra Cut, which would be ample for navigation. The water surface of the lake will be maintained during the rainy season at 87 feet above sea level, making the minimum channel depth in the Canal 47 feet. As navigation can be carried on with about 39 feet of water, there will be stored for the dry season surplus over 7 feet of water. Making due allowance for evaporation, seepage, leakage at the gates, and power consumption, this would be ample for 41 passages daily through the locks, using them at full length, or about 58 lockages a day when partial length is used, as would be usually the case, and when cross filling from one lock to the other through the central wall is employed. This would be a larger number of lockages than would be possible in a single day. The average number of lockages through the Sault Ste. Marie Canal on the American side was 39 per day in the season of navigation of 1910, which was about eight months long. The average number of ships passed was about 1| per lockage. The freight carried was about 26,-000,000 tons. The Suez Canal passed'about 12 vessels per day, with a total tonnage for the same year of 16,582,000. The water level of Gatun Lake, extending through the Culebra Cut, will be maintained at the south end by an earth dam connecting the locks at Pedro Miguel with the high ground to the westward, about 1,400 feet long, with its crest at an elevation of 105 feet above mean tide. A concrete core wall, containing about 700 cubic yards, will connect the locks with the hills to the eastward; this core wall will rest directly on the rock surface and is designed to prevent percolation through the earth, the surface of which is above the Lake level. A small lake between the locks at Pedro Miguel and Miraflores will be formed by dams connecting the walls of Miraflores locks with the high ground on either side. The dam to the westward will be of earth, about 2,700 feet long, having its crest about 15 feet above the water in Miraflores Lake. The east dam will be of concrete, containing about 75,000 cubic yards; will be about 500 feet long, and will form a spillway for Miraflores Lake, with crest gates similar to those at the Spillway of the Gatun Dam. There will be 6 double locks in the Canal; three pairs in flight at Gatun, with a combined lift of 85 feet; one pair at Pedro Miguel, with a lift of 30f feet, and two pairs at Miraflores, with a combined lift of 54f feet at mean tide. The usable dimensions of all are the sameï¿½a length of 1,000 feet, and width of 110 feet. Each lock will be a chamber, with walls and floor of concrete, and mitering gates at each end. The lock gates will be steel structures seven feet thick, 65 feet long, and from 47 to 82 feet high. They will weigh from 390 to 730 tons each. Ninety-two leaves will be required for the entire Canal, the total weighing 60,000 tons. The leaves are shells of structural steel covered with a sheathing of steel riveted to the girder framework. Each leaf is divided horizontally into two separate compartments. The lower compartment is watertight, for the purpose of making the leaf so buoyant that it will practically float in the water and thus largely relieve the stress upon the bearings by which it is hinged to the wall. This watertight compartment is subdivided vertically into three sections, each independently watertight so that if the shell should be broken in any way or begin to leak, only one section would probably be affected. An air shaft 26 inches in diameter runs from the bottom compartment up to the top of the gate, and this also is watertight where it passes through the upper half of the leaf. Intermediate gates will be used in all except one pair of the locks, in order to save water and time; if desired, in locking small vessels through, the gates being so placed as to divide the locks into chambers 600 and 400 feet long, respectively. Ninety-five per cent of the vessels navigating the high seas are less than 600 feet long. The combined result is that the volume of each lower lock is less than that of the upper when the tide is higher than about two feet below mean tide, and the lock is incapable of receiving the full contents of an entire upper lock without causing an overflow of the walls and gates. A portion of the water from an upper lock must be wasted through the culverts or cross-emptied into the twin lock. To diminish this waste as much as practicable, the volume of the lower locks has been enlarged by increasing the height of the walls and gates to 82 feet which is the maximum consistent with economy and safety in construction. In the construction of the locks, it is estimated that there will be used approximately 4,200,000 cubic yards of concrete, requiring about the same number of barrels of cement. The depth of water over the miter sills of the locks will be 40 feet in salt water and 41f feet in fresh water. The average time in filling and emptying a lock will be about fifteen minutes, without opening the valves so suddenly as to create disturbing currents in the locks or approaches. The time required to pass a vessel through all the locks is estimated at 3 hours; one hour and a half in the three locks at Gatun, and about the same time in the three locks on che Pacific side. The time of passage of a vessel through the entire Canal is estimated as ranging from 10 to 12 hours, according to the size of the ship, arid the rate of speed at which it can travel. The machinery for opening and closing the miter gates was invented in the office of the Assistant Chief Engineer by Edward Schildhauer, Electrical and Mechanical Engineer, and a patent has been issued on it. It is the subject of the illustration herewith. (Plate I.) It consists essentially of a crank gear, to which is fastened one end of a strut or connecting rod, the other end of which is fastened ;o a lock gate. The wheel moved through an arc of 197 degrees, closes or opens the gate leaf, according to the direction in which it is turned. One operation takes 2 minutes. The crank gear is a combination of gear and crank, is constructed of cast steel, is 19 feet 2 inches in diameter, and weighs approximately 35,000 pounds. It is mounted in a horizontal position on the lock wall; turns on a large center pin, and is supported at the rim in four places by rollers. The center pin is keyed into a heavy casting anchored securely to the concrete. The crank-gear has gear teeth on its rim and Is driven through a train of gears and pinions by an electric motor in a contiguous room. The motor is remotely controlled by an operator who is stationed at a center control house near the lower end of the upper locks. A simple pull of a small switch is sufficient to either close or open a 700-ton ga te, theoperation being perfectly automatic. No ship will be allowed to pass through the locks under its own power, but will be towed through by electric locomotives operating on tracks on the lock walls. The system of towing provides for the passing through the locks of a ship at the rate of 2 miles an hour. The number of locomotives will vary with Ihe size of the vessel. The usual number required will be 4: 2 ahead, 1 on each wall, imparting motion to the vessel, and 2 astern, 1 on each wall, to aid in keeping the vessel in a central position and to bring it to rest when entirely within the lock chamber. (Plates J and K.) They will be equipped with a slip drum, towing windlass and hawser which will permit the towing line to be taken in or paid out without actual motion of the locomotive on the track. The locomotives will run on a level except when in passing from one lock to another they climb heavy grades. There will be two systems of tracks, one for towing, and the other for the return of the locomotives when not towing. The towing tracks will have center racks or cogs throughout, and the locomotives will always operate on this rack when towing. At the incline between locks the return tracks will also have rack rails, but elsewhere the locomotives will run by friction. The only crossovers between the towing and return tracks will be at each end of the locks, and there will be no switches In the rack rail. Several protective devices have been adopted to safeguard the gates in the locks. the purpose in the lock floor. It will be raised again after the ship passes. The raising and lowering will be accomplished from both sides by mechanism mounted in chambers or pits in the lock walls. This mechanism will consist of a hydraulically operated system of cylinders, so that 1 foot of movement by the cylinder will accomplish 4 feet by the chain. If a ship exerting a pressure of more than 750 pounds to the square inch should run into the fender, the chain will be paid out gradually by an automatic release until the vessel comes to a stop. Thus, a 10,000-ton ship, running at 4 knots an hour, after striking the fender can be brought to a stop within 73 feet, which is less than the distance which will separate the chain from the gate. Second. Double gates will be provided at the entrances to all the locks and at the lower end of the upper lock in each flight, the guard gate of each pair protecting the lower gate from ramming by a ship which might possibly get away from the towing locomotives and break through the fender chain. Emergency Dam is shown cloaed with Wicket Girders and some Gates lowered in place. Emergency Dam is shown open with Wicket Girders and Gates raised. structed from the bottom upward,completely closes the channel. When the dam has checked the main flow, the remainder, due to the clearance between the vertical sides of the gates, may be checked by driving steel pipes between the sides of the adjacent panels. These dams will be operated in three movements, and the machinery for operating is, therefore, in three classes, gate-moving, raising and lowering the wicket girders, and hoisting the gates on the girders, all driven by electric motors. To permit examining, cleaning, painting, and repairing the lower guard gates of the locks, and the Stoney gates of the Spillway dam, and for access in the dry to the sills of the emergency dams, it is proposed to provide floating caisson gates of the molded ship type. When their use is required the caissons will be towed into position in the forebay of the upper lock, above the emergency dam, or between the piers of the Spillway, and sunk. The caissons will be equipped with electric motor driven pumps for use in pumping out the caissons and for unwatering the locks. The gates, valves, and fender chains of the locks will be operated by electricity, and remotely controlled from a central point; that is, there will be a central con trol station for each of the series of locks at Gatun, Pedro Miguel, and Miraflores. In passing a ship through the locks it will be necessary to open and close the miter gates weighing from 390 to 730 tons, to fill and empty lock chambers containing from three and one half to five million cubic feet of water, to raise and lower fender chains weighing 24,098 pounds each, and to tow the vessel through the locks. All these operations, except that of towing, will be controlled by one man at a switchboard. them by means of culverts under the lock floors, which connect with larger culverts in the lock walls, through which water is carried from the higher to the lower levels. The main supply culverts are 18 feet in diameter, and the flow of water through them is controlled by rising-stem gate valves, which can be completely opened or closed in one minute. In the center wall the culvert feeds both lock chambers, and therefore at each outlet into the lateral culverts there is a valve of the cylindrical type, in order that water may be let into or withdrawn from either chamber at will. A complete opening or closing of these cylindrical valves takes ten seconds. The miter gates are never opened or closed with a head of water on either side of them, the chambers being first emptied or filled by means of the valve and culvert system. The time required either to open or close the miter gate is two minutes. A ship to be raised to the lake level will come to a full stop in the forebay of the lower lock, prepared to be towed through one of the duplicate locks by electric towing locomotives. The water in the lower lock chamber will be equalized with the sea level channel, after which the miter gates will be opened, the fender chain lowered and the vessel passed into the first chamber, where the water is at sea level. Then the miter gates will be closed. The rising stem gate valves at the outlet of the main culverts will be closed, while those above will be opened, allowing water to flow from an upper level into the lower chamber, which, when filled, will raise the vessel 2Sï¿½ feet, to the second level. This operation will be repeated in the middle and upper locks until the ship has been raised to the full height of 85 feet above the level of the sea. At Gatun in the passing of a large ship through the locks, it will be necessary to lower 4 fender chains, operate 6 pairs of miter gates and force them to miter, open and close 8 pairs of rising stem gate valves for the main supply culverts, and 30 cylindrical valves. In all, no less than 98 motors will be set in motion twice during each lockage of a single ship, and this number may be increased to 143, dependent upon the previous condition of the gates, valves and other devices. Each gate leaf, valve, and fender chain is operated by a separate motor mounted near the machinery in chambers in the lock wall, the motors acting through suitable gears (or pump in the fender chain) upon the various machines. In each machinery chamber will be erected a starting panel containing contactors by which current will be applied to the motor and these panels will in turn be con broiled from a main unit in the central control house. Some of the machinery chambers at Gatun will be 2,700 feet distant from the point of control; 90 per cent of them will be within 2,000 feet, and 50 per cent of the total within 1,200 feet. The station from which control will be exercised over the movement of all the machines will be on the center wall at the lower end of the upper flight of locks at Gatun, and similarly placed at Pedro Miguel and Miraflores. It will be in a building raised high enough above the top of the wall to allow a towing locomotive to pass under, a height of 16 feet, and to command an uninterrupted view of every part of the locks. In this house will be a double control board duplicated to conform to the duplication in locks. The control board will be in the nature of a bench or table, 32 inches above the floor, containing a representation, pare model and part diagrammatic, of the flight of locks controlled by the respective series of switches. Standing at his switchboard the operator will throw the switches, and will see before him in model or diagram the progress of the fender chains as they rise and fall, the movement of the miter gates inch by inch, the opening and closing of the gate valves in the main culverts at every stage, the operation of the cylindrical valves, and, in addition, indication of the gradual rise or fall of the water in the lock chambers. The switches controlling the various motors, together with their indicators, will be mounted upon the board in the same relative position as the machines themselves in the lock walls. Some distortion of scale will be allowed, to give room for the switches. The board must not be over 4 feet in width, in order that the operator may be able to reach beyond the middle of it, and the length of the board is limited to 30 feet at Gatun, and proportionally at the other locks. The system will be interlocking, so that certain motors can not be started in a certain direction until other motors are operated in a proper manner to obtain consistent operation on the whole, and to avoid any undesirable or dangerous combinations in the positions of valves, gates, or fender chains. In this way and by the use of limit switches the factor of the personal equation in operating the machines is reduced to a minimum, almost mechanical accuracy being obtained. Before the operating pair of valves in the main culverts can be opened,at least one pair of valves at the other ends of the locks, both upstream and downstream, must first be closed. This limits an operator to the act of equalizing water levels between locks, and keeps him from allowing water to flow from, say the lake level to the middle lock past the upper lock, thus preventing a possible flooding of the lock walls and machinery rooms. Interlocks, devoted to the control of action between the gate valves in the main culverts and the miter gates, "prevenc valves being opened a lock length above or below a miter gate which is being opened or closed, arid thus prevent an operator causing a flow of water while the miter gates are being moved. Interlocks for the cylindrical valves guarding the openings from the center wall culvert to the lateral culverts will keep those of one side or the other closed at all times, except when it may be desired to cross-fill the chambers, when they may be opened by special procedure. An interlock prevents the operator from starting to open a miter gate before unlocking the miter-forcing machine. The miter gates guarded by a fender chain must be opened before the chain can be lowered, and the chain must be raised again before the gate can be closed, or more exactly the switches must be thrown in this order, but the operations may proceed at the same time. The simple interlocks will prevent such a mistake as leaving the chain down through lapse of memory when it should be up to protect the gate. will have about 850 candlepower. White lights will be used throughout, and, in order to eliminate the possibility of confusing the lights with one another and wi th the lights on shore, all range lights, beacons, and buoys will have individual characteristics formed by flashes and combinations of flashes of light and dark intervals. Totals by Divisions and Amount to be Excavated. ing in all a total of 225 acres. One variety of slide is caused by the slipping of the top layer of clay and earth on a smooth sloping stirface of a harder material. The largest slide of this character is that known as Cucaracha on the east bank of the Canal just south of Gold Hill. This gave the first French company trouble during the final years of its operations. It first gave the Americans trouble in 1905, and between that date and July 1, 1912, nearly 3,000,000 cubic yards of material were removed from the Canal because of it. It broke nearly 1,900 feet back from the axis of the Canal and covers an area of 47 acres. Another variety of slide, properly called break, is due to the steepness of the slopes and the great pressure of the superincumbent material upon the underlying layers of softer material. The largest slide or break of this type is on the west side of the Cut at Culebra just north of Contractor's Hill and covers an area of 75 acres. Over 7,000,000 cubic yards of material have been removed from this slide and it is thought that by the time the Canal shall have been completed something like 10,000,000 cubic yards will have been taken out. On the east side of the Cut a similar slide covers an area of about 50 acres, breaking back about 1,300 feet from the center of the Canal. About a half million cubic yards have been taken out of this slide and more remains to be removed. It is estimated that the total amount of material removed from the Canal because of the slides will aggregate between 21,000,000 and 22,000,000 cubic yards. depth of drill holes has been about 27 feet, three feet deeper than the steamshovcls have excavated. The drill holes, placed about 14 feet apart, are loaded with 45 per cent potassium nitrate dynamite in quantities depending upon the character of the rock, and are connected in parallel and fired by means of a current from an electric light plant. The maximum number of drills in use at any one time in Culebra Cut was 377, of which 221 were tripod and 156 well. With these over 90 miles of holes have been drilled in a single month. A pound of dynamite has been used to about every 2\ cubic yards of material blasted, and the quantity used in Culebra Cut during several years has averaged about 6,000,000 pounds a year. There are several classes of steamshovels engaged in excavating work, equipped with dippers ranging in capacity from If cubic yards to 5 cubic yards, and a trenching shovel, which has a dipper with a capacity of f of a cubic yard. In Culebra Cut excavation the 5-yard dippers have been used almost entirely. 21 cars in hauling from the cut at Matachin. The large dump train is composed of 27 cars, and the small dump train of 35 cars. The average load of a train of flat cars, in hauling the mixed material known as "the run of the Cut," is 610.7 tons (based on a 20-car train); of a train of large dump cars, 737.68 tons, and of a train of small dumps, 562.5 tons. The average time consumed in unloading a train of flat cars is from 7 to 15 minutes; in unloading a train of large dump cars, 15 to 40 minutes; and in unloading a train of small dump cars, 6 to 56 minutes. The large dump cars are operated by compressed air power furnished by the air pump of the locomotive, while the small dump cars are operated by hand. The record day's work for one steamshovel was that of March 22, 1910, 4,823 cubic yards of rock (place measurement), or 8,395 tons. The highest daily record in the Central Division was on March 11, 1911, when 51 steam shovels and 2 cranes equipped with orange peel buckets excavated an aggregate of 79,484 cubic yards, or 127,742 tons. During this day, 333 loaded trains and as many empty trains were run to and from the dumping grounds. The greatest number of shovels in use at one time in the Cut was 43, and the greatest monthly excavation in any single month, in the Cut, was obtained in March, 1911, when 1,728,748 cubic yards of material mostly rock, were excavated. To handle this amount of material required the services of 115 locomotives and 2,000 cars, giving about 160 loaded trains per day to the dumps, which on the average were about 12 miles distant, the haul one way varying from about one mile to 33 miles. To serve properly the trains and shovels employed in excavation work in the Cut, although it is less than nine miles in length, about 100 miles of track have been required or an average of over nine parallel tracks at all points. from a base line drawn from Toro Point to Colon light, and will be 10,500 feet in length, or 11,700 feet, including the shore connection, with a width at the top of fifteen feet and a height above mean sea level of ten feet. The width at the bottom will depend largely on the depth of water. It will contain approximately 2,840,000 cubic yards of rock, the core being formed of rock quarried on the mainland near Toro Point, armored with hard rock from Porto Bello. Work began on the breakwater in August, 1910, and on December 1, 1912, the trestle and fill were completed to full length, 11,500 feet. On the same date about one-seventh, or 1,643 feet, of the rock armor had been placed. The estimated cost is $5,500,000. A second breakwater has been proposed for Limon Bay, but this part of the project has not been formally acted upon. The purpose of the breakwaters is to convert Limon Bay into a safe anchorage, to protect shipping in the harbor of Colon, and vessels making the north entrance to the Canal, from the violent northers that are likely to prevail from October to January, and to reduce to a minimum the amount of silt that may be washed into the dredged channel. The breakwater at the Pacific entrance will extend from Balboa to Naos Island, a distance of about 17,000 feet, or a little more than three miles. It will lie from 900 to 2,700 feet east of and for the greater part of the distance nearly parallel to the axis of the Canal prism; will vary from 20 to 40 feet in height above mean sea level, and will be from 50 to 3,000 feet wide at the top. It is estimated that it will contain about 18,000,000 cubic yards of earth and rock, all of which will be brought from Culebra Cut. It is constructed for a two-fold purpose; first, to divert cross currents that would carry soft material from the shallow harbor of Panama into the Canal channel; second, to furnish rail connection between the islands and the mainland. Work was begun on it in May, 1908, and on November 6, 1912, the last piles were driven connecting Naos Island with the mainland. On the same date about one-half mile of trestle remained to be filled. CLASSIFIED EXPENDITURES TO NOVEMBER 1, 1912. The balances carried in expenditure accounts, which are included in the last item above, for water works, sewers, and pavements in the cities of Panama and Colon amounted altogether to $2,395,358.79. The unexpended balance in the appropriation for sanitation in the cities of Panama and Colon, available for expenditures on water works, sewers, and pavements was $97,465.64, including transfer of appropriations for quarter ended September 30, 1912. The Canal Zone contains about 436 square miles, about 95 of which will be under the waters of the Canal .and Gatun and Miraflores Lakes. It begins at a point 3 marine miles from mean low water mark in each ocean, and extends for 5 miles on each side of the center line of the route of the Canal. It includes the group of islands in the Bay of Panama named Perico, Naos, Culebra, and Flamenco. The cities of Panama and Colon are excluded from the Zone, but the United States has the right to enforce sanitary ordinances in those cities, and to maintain public order in them in case the Republic of Panama should not be able, in the judgment of the United States, to do so. within the Zone boundries which are owned by private persons. The United States will also control the area to be covered by Gatun Lake which extends beyond the lines of the Canal Zone. The population of the Canal Zone, official census, is 62,810; of Panama City, 35,368; of Colon, 17,749. 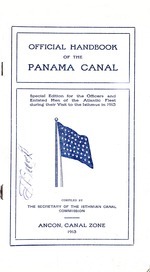 The Canal force is recruited and housed by the Quartermaster's Department which has two general branches, labor and quarters, and material and supplies. Through the labor and quarters branch there have been brought to the Isthmus 44,394 laborers, of whom 11,797 came from Europe, 19,448 from Barbados, the balance from other islands in the West Indies and from Colombia. No recruiting is required at present, the supply of labor on the Isthmus being ample. In addition to the above there were in the employ of contractors on the Isthmus, 454 gold and 3,045 silver employes, a total of 3,499.
laborer is 10 cents an hour, but a few of these doing work of an exceptional character are paid 16 and 20 cents. The larger part of the Spaniards are paid 20 cents an hour, and the rest 16 cents an hour. The material and supply branch carries in eight general storehouses a stock of supplies for the Commission and Panama Railroad valued approximately at $4,500,000. About $12,000,000 worth of supplies are purchased annually, requiring the discharge of one steamer each day. The Canal and Panama Railroad forces are supplied with food, clothing and other necessaries through the Subsistence Department, which is divided into two branchesï¿½Commissary.and Hotel. It does a business of about $7,500,000 per annum. The business done by the Commissary Department amounts to about $6,000,000 per annum, and that done by the hotel branch to about $1,500,000 per annum. The Commissary system consists of 22 general stores in as many Canal Zone villages and camps along the relocated line of the Panama Railroad. It is estimated that with employes and their dependents, there are about 65,000 people supplied daily with food, clothing and other necessaries. In addition to the retail stores, the following plants are operated at Cristobal: Cold storage, ice making, bakery, coffee roasting, ice cream, laundry and packing department. A supply train of 21 cars leaves Cristobal every morning at 4 a. m. It is composed of refrigerator cars containing ice, meats, and other perishable articles, and ten containing other supplies. These are delivered at the stations along the line and distributed to the houses of employes by the Quartermaster's Department. of three meals. There are served at these messes about 200,000 meals per month. There are also operated for the. West Indian laborers 16 kitchens, at which they are served a ration of three meals for 27 cents per ration. There are about 100,000 meals served monthly at these kitchens. The supplies for one month for the line hotels, messes and kitchens costs about $85,000; labor and other expenses about $16,500. The monthly receipts, exclusive of the revenue from the Hotel Tivoli, amount to about $105,000. The permanent administration and Canal headquarters building will be on a knoll west of Ancon quarry where it will overlook both the terminal piers and the Canal entrance. It is to have 75,000 square feet of floor space and is to cost not more than $375,000, including $25,000 for that part assigned to permanent records. The quarters for employes attached to the administration building will be erected in the general area adjacent to and northeast of it, and employes connected with the shops, clocks, and other terminal facilities at Balboa will be housed in quarters erected in the area surrounding the slope of Sosa Hill and on the fill adjoining the Ancon-Balboa highway. There will be a permanent settlement at Pedro Miguel for employes of the Pacific locks, and one at Gatun for employes of the Atlantic locks. The settlement at Cristobal will be maintained, and possibly the settlement at Ancon. No necessity is apparent for any other than the above five settlements, except for the military forces which may be stationed on the Isthmus. ings for small boats at the head of each slip for the full width between piers. The construction of one pier only will be undertaken at first. The old French steel wharf, about 1,000 feet long, will be retained for some time in the future, for commercial purposes. Two wharves and one pier are under construction at Cristobal, behind a mole and breakwater, built out from shore toward the Canal channel, and paralleling the boundary line between Canal Zone and Panamanian waters. Primarily, these docks are to meet the commercial requirements of the Panama railroad, but should there be enough traffic after the Canal is completed to justify it, four other piers, each about 1,000 feet long, and 209 feet wide, with 300-foot slips between will be constructed. The main drydock will be situated at Balboa, and will be capable of accommodating any vessel that can pass through the Canal locks. It will have a usable length of 1,000 feet, a depth over the keel blocks of 35 feet at mean sealevel, and an entrance width of 110 feet. The entrance will be closed by miter gates, similar to those used in the locks. The drydock will have a rock foundation, and its sides will be lined with concrete. Its equipment will include a 40-ton locomotive crane, with a travel on both sides. For vessels of smaller type, an auxiliary drydock will be built at Balboa, in lieu of the marine railways originally contemplated. It will have a usable length of 350 feet, a width at entrance of 71 feet, and a depth over the keel blocks of 13| teet at mean sealevel. It will be provided with a floating caisson. The 40-ton locomotive crane on the main drydock will be utilized for this dock also. The work of providing space for these drydocks, as well as fcr the new shops, is now under way, and requires the excavation of about 300,000 cubic yards of material from the northwest face of Sosa Hill. The excavated material is used in filling the site for the shops and terminal yard. was the opinion of the board in charge of the dock projects, that the commerical requirements in sight would not warrant the construction of a dry dock at Cristobal capable of accommodating large vessels, in view of the building of a drydock at Balboa, to which any large vessel on the Atlantic side could be taken and returned, in case it was found necessary to dock it for repairs'. The plans contemplate furnishing vessels with fuel, fresh water, and supplies of all kinds. The main coaling plant will be situated on the north end of the island, opposite dock No. 11, Cristobal. It will be capable of handling and storing 200,000 tons of coal, with a possible increase of 50 per cent. One hundred thousand tons of the total normal storage is subaqueous. The plant will have railroad connection with the mainland over a bridge of the bascule type, which will cross the French canal at a point about half a mile south of the Mount Hope drydock. The preliminary work on this plant has been begun by the Panama railroad. A subsidiary coaling plant will be situated at Balboa, at the outer end of the southeast approach wall, of the drydock, having a frontage of 500 feet thereon, adapted for discharging vessels. This plant will be capable of handling and storing 100,000 tons of coal, with a possible increase of 50 per cent. Fifty thousand tons of the total normal storage is subaqueous. In addition to coal, facilities will be provided at Cristobal and Balboa for supplying shipping, and the Canal works, with fuel oil. In line with this plan, four steel tanks of 40,000 barrels capacity each, have been contracted for in the United States. men! of the Panama railroad. 4. Mechanical apparatus connected with the coaling plants, fortifications, cold storage plant, wireless stations, etc. S. The making of repairs, etc., required by commercial vessels, and by private individuals and corporations. 6. The making of such repairs as may be required by vessels of the United States Navy. In addition to these, a number of subsidiary buildings will be erected. All of the stiuctures will be of permanent construction, with steel frames. The sides and ends will be left open for ventilation and light, protection from sun and rain being afforded by overhanging sheds. The^main metal working shops, including machine, erecting and tool shops, the forge and pipe shop, and the boiler and shipfitters' shop, together with the shed for the storage of steel, will be placed end on between the drydock and repair wharf. The general storehouse, foundry, woodworking shops, subsidiary buildings, and office building, will be erected parallel to the line of the drydock and water front, northeast of the main shops. Two lines of railroad tracks will extend past each end of the main metal working shops, and one track through their center. The main shops ï¿½will be provided with overhead traveling cranes, the crane runways being extended through each end of the buildings over the railroad tracks. As far as possible, the present machinery will be utilized in the new shops. All of it will be electric driven, including both individual and group drive. It is proposed to retain the drydock shops, for making repairs on the Atlantic side, until sufficient experience is had to determine the extent and character of repair facilities necessary. be placed in service. The steel barges, now in use by the Canal Commission, can be used to good advantage, after the necessary modifications have been made, in the barge and lighter service. A tender for passengers and mail will be furnished at each terminus also, provided the business justifies it. total length of 9f miles. The sharpest curve on the whole line is 7ï¿½. From the south end of Culebra Cut at Paraiso, the railroad runs practically parallel with the Canal to Panama, with maximum grade of 0.45 per cent. Where the railroad crosses the Gatun River, near Monte Lirio, a steel girder bridge has been erected, the center span of which will be made into a lift span where the Gatun Lake is formed, to permit access to the upper arm of the lake. The Chagres River at Gamboa is crossed on a steel girder bridge, J-mile long, with one 200-foot through truss channel span. Numerous other rivers and small streams are crossed on reinforced concrete culverts. Near Miraflores, a tunnel 736 feet long has been built through a hill. The total cost of the new line has been $8,866,392.02. *Via San Francisco and the Great Circle. Naraarjitos Pt.Tortuï¿½uil,la < / J. Area of Gatun Lake at ï¿½ Elex+85 Ft, 163.38SqM. WaterLevel ---~~ ------------------------y d~eo,-.g'e-.-.cI iaol.eve Rek. p-u., .,.o,.,Min d.nyjed --------------------4-------------------------------------------------------PLATE D CROSS SECTiON GATUN DAM A FILU . *-F __F F F F PLATE E-CRO3S SECTION OF LOCK CHAMBERS AND WALLS OF LOOKS A-Passageway for operators. E-These culvets 2un under the lock floor G-Culverts in sidewalls. B-Gallety for electric wircs. and alternate with those from side walls. HI-Lateral culverts. C-Drainage gallery. F-Tels opening Jfon late al culverts into D-Culvert in center walls. lock chamber. 14 WATER SUPPLY OF GATUN LAKE sequently a surplus will need to be stored for only three or four months of the dry season. The smallest run-off of water in the basin during the past 22 years, as measured at Gatun, was that of the fiscal year, 1912, which was about 132 billion cubic feet. Previous to that year the smallest run-off of record was 146 -billion cubic feet. In 1910 the run-off was 360 b illion cubic feet, or a sufficient quantity to fill the lake one and a half times. The low record of 1912 is of interest as showing the effect which a similar dry season, occuring after the opening of the Canal, would have upon its capacity for navigation. Assuming that the Gatun Lake was at elevation plus 87 at the beginning of the dry season on December 1st, and that the hydroelectric plant at the Gatun Spillway was in continuous operation, and that 48 lockages a day were being made, the elevation of the lake would be reduced to its lowest 'point, plus 79.5, on May 7th, at the close of the dry season, after which it would continuously rise. With the water at plus 79 in Gatun Lake there would be 39 feet of water in Culebra Cut, which would be ample for navigation. The water surface of the lake will be maintained during the rainy season at 87 feet above sea level, making the minimum channel depth in the Canal 47 feet. As navigation can be carried on with about 39 feet of water, there will be stored for the dry season surplus over 7 feet of water. Making due allowance for evaporation, seepage, leakage at the gates, and power consumption, this would be ample for 41 passages daily through the locks, using them at full length, or about 58 lockages a day when partial length is used, as would be usually the case, and when cross filling from one lock to the other through the central wall is employed. This would be a larger number of lockages than would be possible in a single day. The average number of lockages through the Sault Ste. Marie Canal on the American side was 39 per day in the season of navigation of 1910, which was about eight months long. The average number of ships passed was about 1'2 per lockage. The freight carried was about 26,000,000 tons. The Suez Canal passed about 12 vessels per day, with a total tonnage for the same year of 16,582,000. 18 THE LOCKS The combined result is that the volume of each lower lock is less than that of the upper when the tide is higher than about two feet below mean tide, and the lock is incapable of receiving the full contents of an entire upper lock without causing an overflow of the walls and gates. A portion of the water from an upper lock must be wasted through the culverts or cross-emptied into the twin lock. To diminish this waste as much as practicable, the volume of the lower locks has been enlarged by increasing the height of the walls and gates to 82 feet which is the maximum consistent with economy and safety in construction. In the construction of the locks, it is estimated that there will be used approximately 4,200,000 cubic yards of concrete, requiring about the same number of barrels of cement. The locks will be filled and emptied through a system of culverts. One culvert 254 sq. ft. in area of cioss section, about the area of the Hudson River tunnels of the Pennsylvania railroad, (Plate H.) extends the entire length of each of the middle and side walls and from each of the large culverts, there are several smaller culverts 33 to 44 sq. ft. in area, which extend under the floor of the lock and communicatewith the lock chambei through holes in the floor. The large culverts are controlled at points near the miter gates by large valves and each of the small culverLs extending from the middle wall feeds in both directions through laterals, thus permitting the passage of water from one twin lock to another, effecting a saving of water. (Plate E.) To fill a lock the valves at the tipper end are opened and the lower valves closed. The water flows from the upper pool through the large culverts into the small lateral culverts and thence through the holes in the floor into the lock chamber. To empty a lock the valves at the upper end are closed and those at the lower end are opened and the water flows into the lower lock or pool in a similar manner. This system distributes the water as evenly as possible over the en tire horizontal area of the lock and reduces the disturbance in the chamber when it is being filled or emptied. (See also "Electric Control of Lock Machinery" p. 26.) The depth of water over the miter sills of the locks will be 40 feet in salt water and 414 feet in fresh water. THE LOCKS 19 The average time in filling and emptying a lock will he about fifteen minutes, without opening the valves so suddenly as to create disturbing currents in the locks or approaches. The time required to pass a vessel through all the locks is esflimated at 3 hours; one hour and a half in the three locks at Gatun, and about the same time in the three locks on Whe Pacific side. The time of passage of a vessel through the entire Canal is estimated as ranging from 10 to 12 hours, according to the size of the ship, and the rate of speed at which it can travel. GATE-MOVING MACHINERY The machinery for opening and closing the miter gates was invented in the office of the Assistant Chief Engineer by Edward Schildhauer, Electrical and Mechanical Engineer, and a patent has been issued on it. It is the subject of the illustration herewith. (Plate I.) It consists essentially of a crank gear, to which is fastened one end of a strLut or connecting rod, the other end of which is fastened co a lock gate. The wheel moved through an arc of 197 degrees, closes or opens the gate leaf, according to the direction in which it is turned. One operation takes 2 minutes. The crank gear is a combination of gear and crank, is constructed of cast steel, is 19 feet 2 inches in diameter, and weighs approximately 35,000 pounds. It is mounted in a horizontal position on the lock wall; turns on a large center pin, and is supported at the rim in four places by rollers. The center pin is keyed into a heavy casting anchored securely to the concrete. The crank-gear has gear teeth on its rim and is driven through a train of gears and pinions by an electric motor in a contiguous room. The motor is remotely controlled by an operator who is stationed at a center control house near the lower end of the upper locks. A simple pull of a small switch is sufficienc to either close or open a 700-ton gate, the operation being perfectly automatic. ELECTRIC CONTROL OF LOCK MACHINERY 27 them by means of culverts under the lock floors, which connect with larger culverts in the lock walls, through which water is carried from the higher to the lower levels. The main supply culverts are 18 feet in diameter, and the flow of water through them is controlled by rising-st m gate valves, which can be completely opened or closed in one minute. In the center wall the culvert feeds both lock chambers, and therefore at each outlet into the lateral culverts there is a valve of the cylindrical type, in order that water may be let into or withdrawn from either chamber at will. A complete opening or closing of these cylindrical valves takes ten seconds. The miter gates are never opened or closed with a head of water on either side of them, the chambers being first emptied or filled by means of the valve and culvert system. The time required either to open or close the miter gate is two minutes. A ship to be raised to the lake level will come to a full stop in the forebay of the lower lock, prepared to be towed through one of the duplicate locks by electric towing locomotives. The water in the lower lock chamber will be equalized with the sea level channel, after which the miter gates will be opened, the fender chain lowered and the vessel passed into the first chamber, where the water is at sea level. Then the miter gates will be closed. The rising stem gate valves at the outlet of the main culverts will be closed, while those above will be opened, allowing water to flow from an upper level into the lower chamber, which, when filled, will raise the vessel 281 feet, to the second level. This operation will be repeated in the middle and upper locks until the ship has been raised to the full height of 85 feet above the level of the sea. At Gatun in the passing of a large ship through the locks, it will be necessary to lower 4 fender chains, operate 6 pairs of miter gates and force them to miter, open and close 8 pairs of rising stem gate valves for the main supply culverts, and 30 cylindrical valves. In all, no less than 98 motors will be set in motion twice during each lockage of a single ship, and this number may be increased to 143, dependent upon the previous condition of the gates, valves and other devices. 28 ELECTRIC CONTROL OF LOCK MACHINERY Each gate leaf, valve, and fender chain is operated by a separate motor mounted near the machinery in chambers in the lock wall, the motors acting through suitable gears (or pump in the fender chain) upon the various machines. In each machinery chamber will be erected a starting panel containing contactors by which current will be applied to the motor and these panels will in turn be controlled from a main unit in the central control house. Some of the machinery chambers at Gatun will be 2,700 feet distant from the point of control; 90 per cent of them will be within 2,000 feet, and 50 per cent of the total within 1,200 feet. The station from which control will be exercised over the movement of all the machines will be on the center wall at the lower end of the upper flight of locks at Gatun, and similarly placed at Pedro Miguel and Miraflores. It will be in a building raised high enough above the top of the wall to allow a towing locomotive to pass under, a height of 16 feet, and to command an uninterrupted view of every part of the locks. In this house will be a double control board duplicated to conform to the duplication in locks. The control board will be in the nature of a bench or table, 32 inches above the floor, containing a representation, parc model and part diagrammatic, of the flight of locks controlled by the respective series of switches. Standing at his switchboard the operator will throw the switches, and will see before him in model or diagram the progress of the fender chains as they rise and fall, the movement of the miter gates inch by inch, the opening and closing of the gate valves in the main culverts at every stage, the operation of the cylindrical valves, and, in addition, indication of the gradual rise or fall of the water in the lock chambers. The switches controlling the various motors, together with their indicators, will be mounted upon the board in the same relative position as the machines themselves in the lock walls. Some distortion of scale will be allowed, to give room for the switches. The board must not be over 4 feet in width, in order that the operator may be able to reach beyond the middle of it, and the length of the board is limited to 30 feet at Gatun, and proportionally at the other locks. ELECTRIC CONTROL OF LOCK MACHINERY 29 The system will be interlocking, so that certain motors can not be started in a certain direction until other motors are operated in a proper manner to obtain consistent operation on the whole, and to avoid any undesirable or dangerous combinations in the positions of valves, gates, or fender chains. In this way and by the use of limit switches the factor of the personal equation in operating the machines is reduced to a minimum, almost mechanical accuracy being obtained. Before the operating pair of valves in the main culverts can be opened, at least one pair of valves at the other ends of the locks, both upstream and downstream, must first be closed. This limits an operator to the act of equalizing water levels between locks, and keeps him from allowing water to flow from, say the lake level to the middle lock past the upper lock, thus preventing a possible flooding of the lock walls and machinery rooms. Interlocks, devoted to the control of action between t'he gate valves in the main culverts and the miter gates,'prevenc valves being opened a lock length above or below a miter gate which is being opened or closed, and thus prevent an operator causing a flow of water while the miter gates are being moved. Interlocks for the cylindrical valves guarding the openings from the center wall culvert to the lateral culverts will keep those of one side or che other closed at all times, except when it may be desired to cross-fill the chambers, when they may be opened by special procedure. An interlock prevents the operator from starting to open a miter gate before unlocking the miter-forcing machine. The miter gates guarded by a fender chain must be opened before the chain can be lowered, and the chain must be raised again before the gate can be closed, or more exactly the switches must be thrown in this order, but the operations may procee(l at, the same time. The simple interlocks will prevent such a mistake as leaving the chain down through lapse of memory when it should be up to protect the gaI te. DRILLING AND BLASTING 37 dcpth of drill holes has been about 27 feet, three feet deeper than the steamshovels have excavated. The drill holes, placed about 14 feet apart, are loaded with 45 per cent potassium nitrate dynamite in quantities depending upon the character of the rock, and are connected in parallel and fired by means of a current from an electric light plant. The maximum number of drills in use at any one time in Culebra Cut was377, of which 221 were tripod and 156 well. With these over 90 miles of holes have been drilled in a single month. A pound of dynamite has been used to about every 24 cubic yards of material blasted, and the quantity used in Culebra Cut during several years has averaged about 6,000,000 pounds a year. CAPACITY OFSTEAMSHOVELS AND DIRT TRAINS There are several classes of steamshovels engaged in excavating work, equipped with dippers ranging in capacity from 1 cubic yards to 5 cubic yards, and a trenching shovel, which has a dipper with a capacity of I of a cubic yard. In Culebra Cut excavation the 5-yard dippers have been used almost entirely. Each cubic yard, place measurement, of average rock weighs about 3,900 pounds; of earth, about 3,000 pounds; of "the run of the Cut," about 3,600 pounds, and is said to represent about a two-horse cart load. Consequently, a five cubic yard dipper, when full, carries 8.7 tons of rock, 6.7 tons of earth, and 8.03 tons of "the run of the Cut.'.' Three classes of cars are used in hauling spoil-flat cars with one high side, which are unloaded by plows weighing from 14 to 16 tons, operated by a cable upon a winding drum, and two kinds of dump cars, one large and one small. The capacity of the flat cars is 19 cubic yards; that of the large dump cars 17 cubic yards, and that of the small dump cars, 10 cubic yards. The flat car train is ordinarily composed of 20 cars in hauling from the cut at Pedro Miguel, and 21 cars in hauling from the cut at Matachin. The large dump train is composed of 27 cars, and the small dump train of 35 cars. 40 BREAKWATERS from a base line drawn from Toro Point to Colon light, and will be 10,500 feet in length, or 11,700 feet, including the shore connection, with a width at the top of fifteen feet and a height above mean sea level of ten feet. The width at the bottom will depend largely on the depth of water. It will contain approximately 2,840,000 cubic yards of rock, the core being formed of rock quarried on the mainland near Toro Point, armored with hard rock from Porto Bello. Work began on the breakwater in August, 1910, and on December 1, 1912, the trestle and fill were completed to full length, 11,500 feet. On the same date about one-seventh, or 1,643 feet, of the rock armor had been placed. The estimated cost is $5,500,000. A second breakwater has been proposed for Limon Bay, but this part of the project has not been formally acted upon. The purpose of the breakwaters is to convert Limon Bay into a safe anchorage, to protect shipping in the harbor of Colon, and vessels making the north entrance to the Canal, from the violent northers that are likely to prevail from October to January, and to reduce to a minimum the amount of silt that may be washed into the dredged channel. The breakwater at the Pacific entrance will extend from Balboa to Naos Island, a distance of about 17,000 feet, or a little more than three miles. It will lie from 900 to 2,700 feet east of and for the greater part of the distance nearly parallel to the axis of the Canal prism; will vary from 20 to 40 feet in height above mean sea level, and will be from 50 to 3,000 feet wide at the top. It is estimated that it will contain about 18,000,000 cubic yards of earth and rock, all of which will be brought from Culebra Cut. It is constructed for a two-fold purpose; first, to divert cross currents that would carry soft material from the shallow harbor of Panama into the Canal channel; second, to furnish rail connection between the islands and the mainland. Work was begun on it in May, 1908, and on November 6, 1912, the last piles were driven connecting Naos Island with the mainland. On the same date about one-half mile of trestle remained to be filled. CANAL APPROPRIATIONS AND EXPENDITURES 41 APPROPRIATIONS. Payment to the New Panama Canal Company._. $40,000,000 .00 Payment to Republic of Panama. -------------10,000,000.00 Appropriation, June 28, 1902. .-------------. 10,000,000.00 Appropriation, December 21, 1905_-------------11,000,000.00 Deficiency, February 27, 1906_--_ -------------5,990,786.00 Appropriation, June 30, 1906-._ ----------------25,456,415.08 Appropriation, March 4, 1907_.---------------27,161,367.50 Deficiency, February 15, 1908._._____ ---------------12,178,900.00 Appropriation, May 27, 1908._----------------. 29,187,000.00 Deficiency, March 4, 1909 ---------------------5,458,000.00 Appropriation, March 4, 1909.___ -------------33,638,000.00 Deficiency, February 25, 1910. -------------------76,000.00 Appropriation, June 25, 1910 ---------------37,855,000.00 Appropriation, March 4, 1911 -----------------45,560,000.00 Appropriation, August, 24, 1912 ---------------28,980,000.00 Private Act. Relief of Elizabeth G. Martin 1,200.00 Private Act. Relief of Marcellus Troxell --1,500.00 Private Act. Relief of W. L. Miles. -------------1,704.18 Private Act. Relief of Chas. A. Caswell----1,056.00 Private Act. Relief of Alexandro Comba 500.00 Private Act. Relief of Douglas B. Thompson 1,500.00 Private Act. Relief of Robert S. Gill .2,520.00 Total._--..-----$322,551,448.76 Appropriation for Fortifications, March 4, 1911 .3,000,000.00 Appropriation for Fortifications, August 24, 1912 2,806,950.00 CLASSIFIED EXPENDITURES TO NOVEMBER 1, 1912. Department of Construction and Engineering-.-$159,411,558.14 Department of Construction of Engin'ring Plant 2,868,362.47 Department of Sanitation._--_ ------15,319,682.40 Department of Civil Administration 5,961,599.68 Department of Law.--. ..30,887.52 Panama Railroad, Second Main Track1,123,477.93 Panama Railroad, Relocated Line e --.8,866,392.02 Purchase and Repair of Steamers_ ---.2,680,112.01 Zone Water Works and Sewers .5,140,506.45 Zone Roadwayss-------.---1,579,724.67 Loans to Panama Railroad Company .3,247,332.11 Construction and Repair of Buildings .10,188,813.63 Purchase from New Panama Canal Company 40,000,000.00 Payment to Republic of Panama .10,000,000.00 M iscellaneous------------. ------. -4,207,175.37 Total.--_-.--.---.$270,625,624.40 Expenditures for Fortifications to Nov. 1, 1912._ 1,685,315.75 The balances carried in expenditure accounts, which are included in the last item above, for water works, sewers, and pavements in the cities of Panama and Colon amounted altogether to $2,395,358.79. The unexpended balance in the appropriation for sanitation in the cities of Panama and Colon, available for expenditures on water works, sewers, and pavements was $97,465.64, including transfer of appropriations for quarter ended September 30, 1912. 8/23/2011 8:37:29 AM 'SUBJ662' is already used as an ID.